Shelly and I thank again the voters for picking Mr. Swirl E. Bones for Viewers choice! (and Judges Choice) Shelly and I discussed this quilt, as I was making it, as I just knew I would not have time to quilt it the way I hoped too. Shelly quilts many of my quilts, so we have a great partnership and she understands my work. It certainly helps to have a best friend quilt your work! For a quilt of this nature, (meaning I made it to be entered in the show) I do not pay her to quilt it. It is a collaboration. We talked about what the quilting needed to be, and what I was thinking. 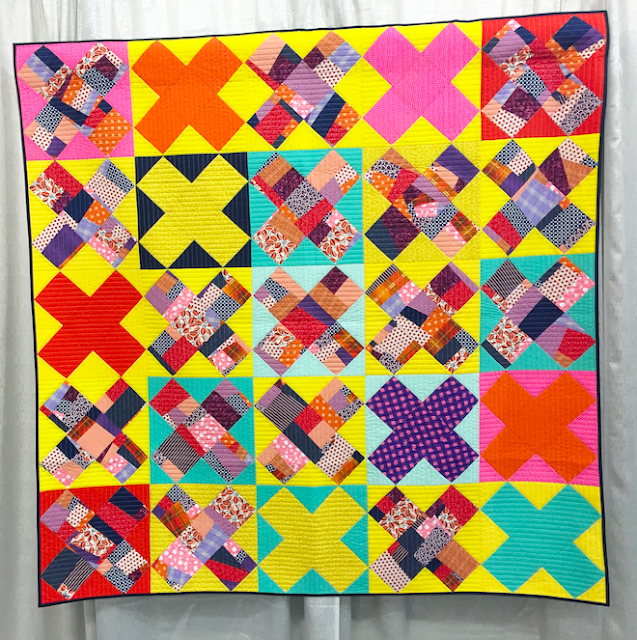 It was a true collaborative effort between her and I.
I designed the quilt, and I gave my ideas to Shelly about elements I'd like to see in the quilting carried through the quilt. She was free to add her story to my quilt. I often work this way. This also means, the monetary award is half Shelly's and half mine... This is OUR quilt. I think this is important, just like when I won Best in Show for Double Edged Love, Lisa Sipes is credited for her beautiful work, half the prize money went to Lisa. Lisa also, was not paid for her quilting on Double Edged Love. It's a collaboration, it is OUR quilt ,We put our two brains together so the award is split between the two of us. Giving credit where credit is due, is very important. Personally and historically, and in this day and age where inspiration is plentiful, why not share where/who you were inspired by? It's an honor an a "good humanly thing to do." 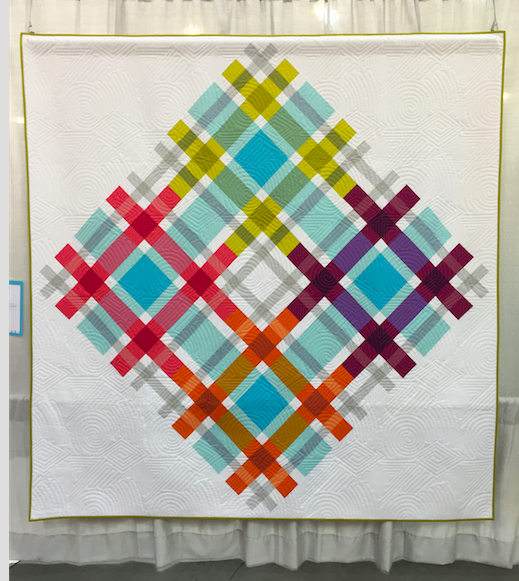 By Leslie Tucker Jenison, the graphic design power and simplicity of this quilt knocks my socks off... I love the color. 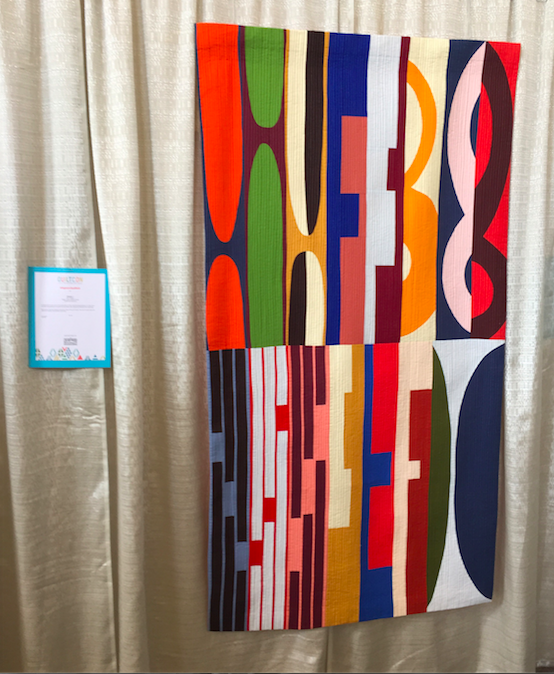 Design wise, probably my most favorite quilt at the show. What's not to love? Great use of color. Color definitely caught my eye at this show...Obviously! 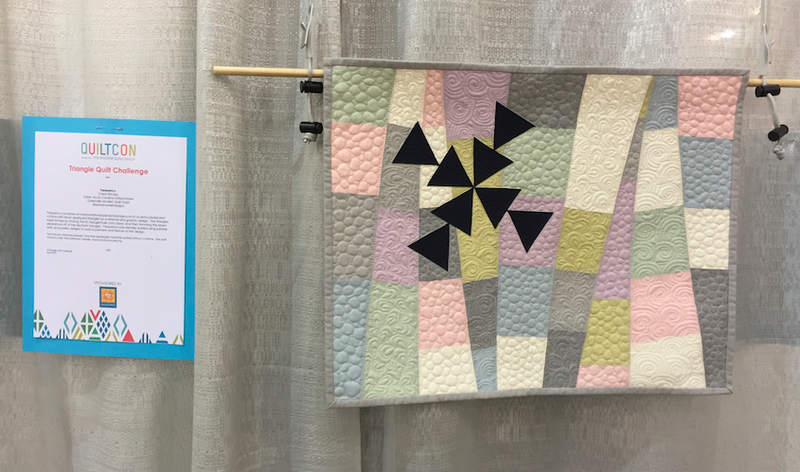 by Cheryl Brickey : Mini Triangle quilt challenge. Falling by Kathy York. Impeccably made, clean, and very beautiful visually.... Gorgeous color. Kathy won QuiltCon last year. I'm sorry I did not get the name of this quilts maker... Anyone know? I love it's simplistic pattern, and graphic punch. Everything about it makes me happy. It's hard to pick favorites... I literally had one hour to walk the floor to see quilts, so I looked for what grabbed my eyes and allowed my intuition to guide me. Well done to all who had quilts in the show. 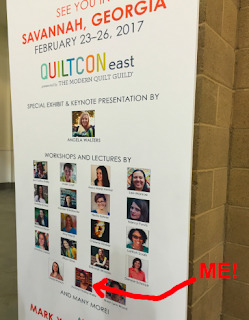 What I love about QuiltCon is that everyone is so happy to be there. I also LOVE that they hang the quilts on LIGHT backgrounds. It feels so much air-ier and happier then any other show. (those black drapes really make for cave like viewing at other shows) The brightness really adds to the show. 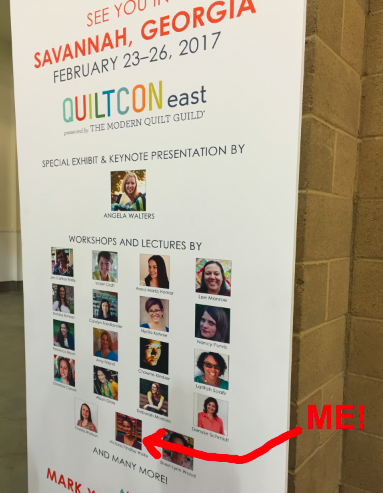 I love teaching at QuiltCon also. Students are very happy to be there... And everything ran very smoothly, in my experience. Images from my awesome students work, in the classes I taught, coming soon. Till Next year QuiltCon peeps! See you in Savannah! What a great review Victoria. I loved the show and noticed as well how bright and airy things are on the light backgrounds. And I loved how happy everyone was to be there and especially the staff and crew! they were terrific, cheerful, helpful and always welcoming. But most of all I enjoyed the classes, knowledgable and engaging teachers there to see we had a great experience. Thank you...today I hope to get back to Stretch Hexies! It was lovely to meet you in person! (Outside fb) and to have you in class! I look forward to seeing your stretch hexies & tumblers! I agree wholeheartedly about the collaboration and giving credit. 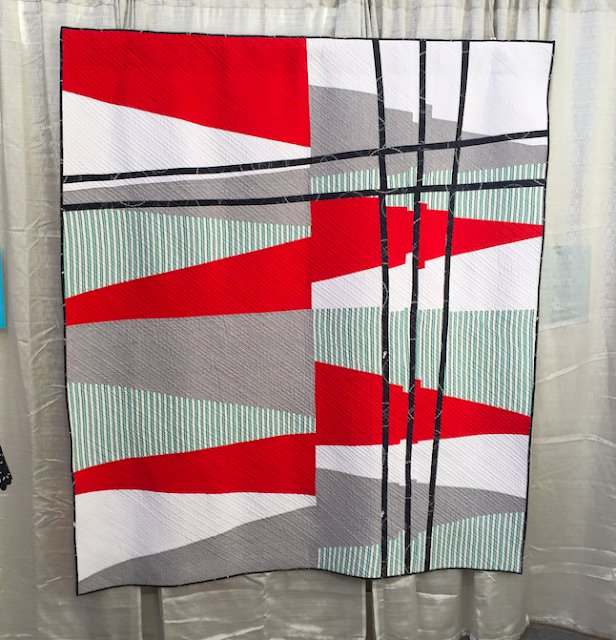 These quilts are made by two creative minds with two creative visions whose collaboration results in a whole being greater than the sum of its parts. Well put Victoria! Thank you for sharing these lovely quilts from QuiltCon ~ you do have wonderful taste! It was great fun to see you! So nice to see you Lori!! Thanks for sharing these beauties and talking about your work, Victoria! I enjoyed seeing your exhibit in Lincoln the day of the July dedication of the expansion of Quilt House, along with the chance to say hello at the reception. I save lots of ideas from blogs, but, I always try to add the link to the blog post where I saw it (even if I change it up drastically, so that I can give them credit. When I blog about the item, not only do I post the link, but, I also try to leave them a comment on that post, so that they can see what I did with their idea. Yes, credit where credit is due! 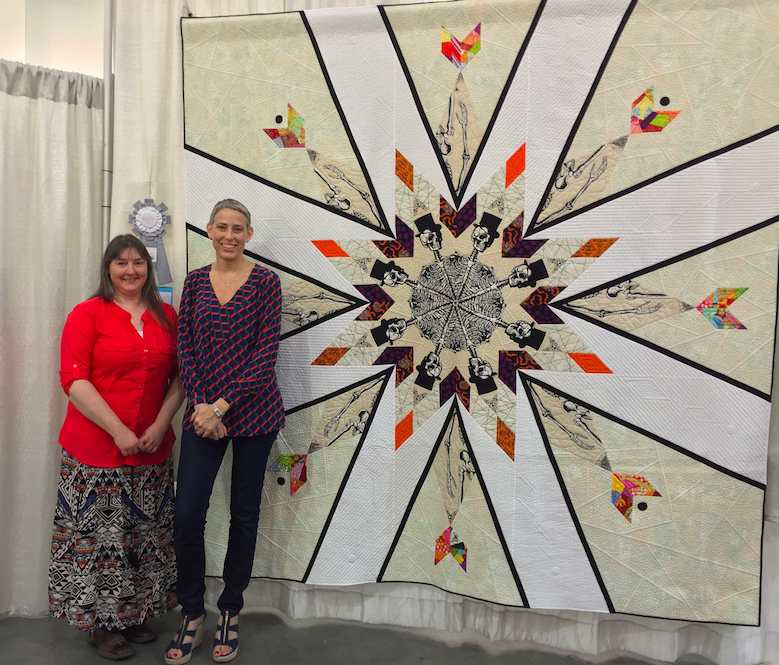 Congrats to both of you on the quilt and quilting. Thanks for the kind words about my quilt, Jurgis and Ona! I'm the mystery maker @nerdcamp on IG. Found her! Kerri Green is from Dallas. Not sure about a website yet. I always give credit to the Quilter & Pattern Designer. Even if I pay for the quilting. Eleanor Burns says she quilts by Check. Thanks for posting. So real of you to point out that the quilting is important and give credit where credit is well deserved. What a great quilt! Your creativeness never ceases to amaze me. (I'm still trying to figure out how you constructed Mr. Behemoth Bones so precisely with all those huge angles). I don't comment often, but you were my first blog to read, and after several years of reading a several, I'm back down to just yours, because you do such original things. I also appreciated that the quilts were hung so you could get a straight on look/picture of practically every quilt. At many shows, you have to see and photograph the majority of the quilts from an angle. It was great finally to meet you in person and I really enjoyed your class. Don't hold your breath waiting for a picture of my finished quilt, I'm not a speed sewer - and I might actually do much of it by hand! I know I can do those "Y" seams faster and better by hand than on my machine. But I WILL finish it. 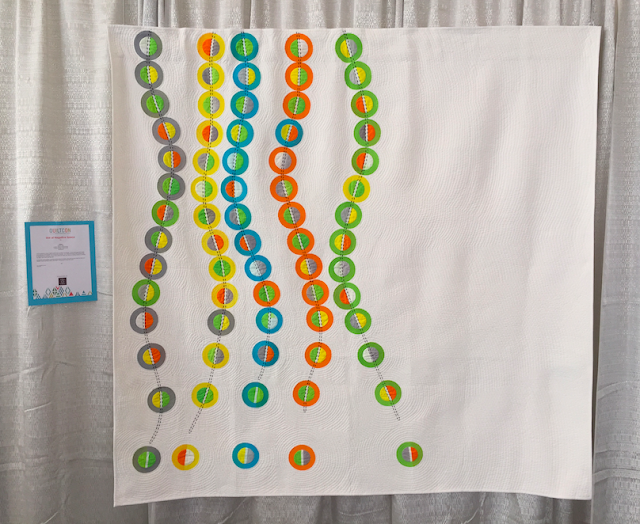 I loved seeing this huge and fantastic quilt, and you too, at QuiltCon. Congratulations! Your quilt is lovely. Thanks for sharing your photos with us that could not be there. Cheers.